It was quite an opening week as eight teams that played for a state title last fall dropped their opening game -- including three defending state champions. We also had two top-ranked teams lose in Week 1. Will things settle down in Week 2? Derby remains on top of the Class 6A poll after having no trouble with Goddard-Eisenhower in a 48-14 win. The Panthers won their 24th consecutive game as Brody Kooser opened his senior season rushing for more than 100 yards and four touchdowns. Shawnee Mission East remains at No. 2 after beating Sunflower League rival Olathe South 28-6 on Thursday night. Blue Valley North is the new No. 3 team in this week’s poll after preseason No. 3 Blue Valley fell 55-10 to Bishop Miege. 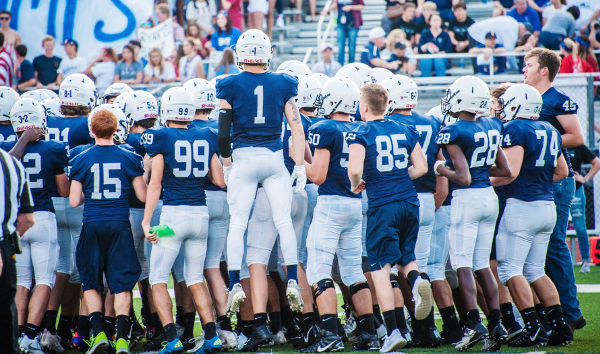 Blue Valley North opened with a 48-13 win over Blue Valley Northwest. North quarterback Graham Mertz, a Miege transfer, passed for 276 yards and six touchdowns in the win. Lawrence Free State enters the poll at No. 4 after beating Shawnee Mission West, 56-9. The Firebirds fell behind 2-0 early, but rattled off 56 consecutive points to beat the Vikings. Finally, Topeka High enters the rankings at No. 5 after Wichita Northwest’s late loss to Bishop Carroll. Topeka outscored then 4A-II No. 1 Topeka Hayden, 51-46 behind a big night from sophomore running back Ky Thomas. Thomas rushed for 242 yards and five touchdowns and also returned a kickoff 95 yards for another score. St. Thomas Aquinas remains atop the Class 5A poll after a 35-14 win over Gardner-Edgerton to open the season. The Saints travel to 6A No. 3 Blue Valley North this week. Two-time defending 5A champion Mill Valley turned the ball over five times and lost to St. James Academy 45-21 to open the season. The Jaguars fall three spots to No. 5 in this week’s poll, while St. James moves into the top five at No. 4 this week. Running back Jack Petz rushed for 125 yards and three touchdowns to pace the Thunder. Bishop Carroll moves up two spots to No. 3 this week after opening the Dusty Trail era with a dramatic 40-35 win over then 6A No. 5 Wichita Northwest. Desmond Smith scored a touchdown with 14 seconds remaining to propel Carroll to the win. Last season’s state runner-up Goddard also moves up two spots to No. 2 this week after a 49-20 road win at Olathe Northwest. Quarterback Blake Sullivan rushed for more than 130 yards and two touchdowns, and passed for more than 165 yards and three more scores. Bishop Miege has dominated Class 4A-I in recent years and opened 2017 with a 55-10 win over then Class 6A No. 3 Blue Valley. The Stags built a 35-3 halftime lead helped by a pair of Tiger turnovers and a pair of touchdown runs by sophomore Brison Cobbins. Beyond Miege, the 4A-I poll saw some movement as McPherson moves up two spots to No. 2 after beating last week’s No. 2 Buhler, 33-21. The Bullpups built a 19-0 lead and held off a second-half Buhler charge to win. Buhler falls two spots to No. 4 this week, while Maize South retains the No. 3 spot. Maize South shut out Towanda-Circle 47-0 in Week 1, and will host No. 2 McPherson this week. De Soto remains in the No. 5 spot after opening the season with a 30-8 win over Frontier League rival Ottawa. Class 4A-II is where we expect a lot of movement in the top five throughout the first-half of the season. This week we have a new No. 1 top-ranked Topeka Hayden fell 61-46 against Class 6A No. 5 Topeka High. As a result, the Wildcats drop one spot to No. 2 this week and make way for Wichita Collegiate to take over the top spot. The Spartans posted a 42-0 shutout of Rose Hill to open the season. They will host a solid 3A team in Hoisington this week. Columbus remains at No. 3 this week after a 48-0 shutout of Riverton. Holton and Holcomb switched places in this week’s poll. The Holton Wildcats moved up a spot to No. 4 this week after a 45-14 win over Atchison, while Holcomb fell one spot to No. 5 after beating Cimarron 15-12. Both Holton and Holcomb get solid tests this week with the Wildcats hosting Sabetha and Holcomb traveling to Scott City. Perhaps one of the most surprising results of Week 1 was Marysville’s 52-13 win over three-time defending 3A champion Rossville. Jack Blumer passed for more than 315 yards and threw six touchdown passes in the win. Marysville moves in to the top five at No. 5 in this week’s poll, while Rossville drops out of the top five after being ranked fourth last week. Conway Springs also enters the poll this week at No. 4 after the Cardinals scored 98 points in a 98-18 win over Belle Plaine. Hesston exits the top five after a season-opening 28-24 loss to Garden Plain. Meanwhile, the top three in Class 3A remains unchanged as Silver Lake, Nemaha Central, and Phillipsburg all cruised to victories by 67, 73, and 46 points, respectively. The opening week Mid-Continent League showdown went the way of top-ranked Smith Center as the Redmen defense shutdown Plainville in a 16-7 win. Smith Center remains No. 1 in this week’s poll, while Plainville remains at the No. 3 spot. The new No. 2 team this week is the Jefferson County North Chargers. The Chargers blasted Maur Hill-Mount Academy 50-7 to open the season thanks to three Sam Larson touchdown runs. Last week’s No. 2 team St. Mary’s Colgan drops out of the poll after the Panthers 16-0 loss at Galena. Colgan lost senior quarterback Bryce Hutchins to injury early in Thursday’s game, and struggled on offense against the Bulldog defense. Lyndon moves into the poll this week at No. 4 after the Tigers’ 69-18 win over Yates Center. Lyndon got a huge emotional boost earlier in the day when senior linemen Garrett McCoy surprised his teammates with his release and return home from an Omaha hospital. McCoy has been hospitalized since suffering a brain aneurysm at weights this summer. Finally, Valley Heights enters the poll at No. 5 this week after the Mustangs took care of defending 2-1A champion Troy, 59-26. Preseason No. 5 Sedgwick also fell from the poll after a 31-21 loss to rival Ell-Saline. There is a new top-ranked team in this week’s poll as preseason No. 1 Central Plains was blasted 34-8 by their Central Prairie League rival Victoria on a game that was concluded Saturday night due to weather. Victoria jumps into the top five at No. 5 this week after the Knight defense held Central Plains to only a fourth-quarter touchdown. The Central Plains’ loss drops the Oilers out of the top five this week, and allows St. Francis to move up to the top spot in the poll. The Indians blasted 8M-II’s then No.4 ranked Sharon Springs-Wallace County 46-0, handing the Wildcats their worst loss since 2011. Defending champion Osborne moves up to the No. 2 spot after a 60-14 win over Thunder Ridge. The Bulldogs have one of the fastest backfield’s in the state, and Darnell Holloway settled in a quarterback just fine in his first 8-Man game in rushing for more than 200 yards and three scores. Burlingame opened the season with a 57-0 blowout of Southern Coffey County. Montana Giffin was solid in his debut at quarterback, finishing with 128 passing yards and throwing for four touchdowns. Giffin is filling in at quarterback as all-state senior Dalton Sporing continues to recover from a knee injury suffered during last basketball season. The Hanover Wildcats remain atop the 8M-II poll after opening the season with a 46-6 win over Lebo. The Wildcats didn’t waste any time in scoring 40 points in the first quarter of Friday night’s game. Pike Valley remains ranked No. 2 this week after the Panthers beat Lakeside-Downs, 58-8. Lane Peters rushed for 120 yards and three touchdowns to put him over 4,000 rushing yards for his career. Hodgeman County rolled past Leoti-Wichita County, 56-6. The third-ranked Longhorns get a big test this week when they host 8M-I No. 4 Spearville. Despite having just 14 players on their roster, Otis-Bison enters the poll at No. 4 this week leaping over No. 5 Hutchinson Central Christian. Both sets of Cougars rolled to big victories in Week 1. Otis-Bison shut out a struggling St. John program 58-0, while Central Christian outscored their Heart of the Plains League rival Pretty Prairie, 90-38.